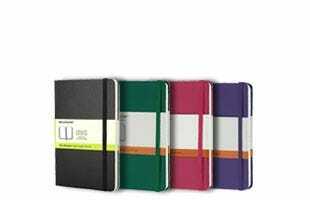 We stock a selection of Moleskine notebooks in a variety of sizes ranging from pocket to extra large, in a choice of lined or plain paper, and soft or hard cover. Most feature an elastic closure which keeps loose papers in tow and a ribbon marker. The Moleskine professional notebook has an innovative page design to help keep you organised with page numbers and an index, as well as a project planning section. Emboss your notebook with initials or similar for that final touch. We stock a range of Moleskine diaries for 2019 featuring the brands grained leather effect cover in soft or hardback (embossing service available for initials etc). 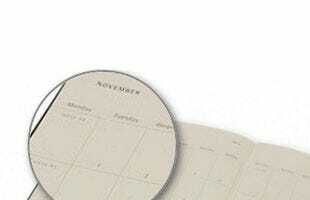 All diaries benefit from a ribbon page marker, elastic closure band, expandable internal pocket and icon stickers. There are various layouts including month to view, week to view and day to page. Sizes range from pocket to medium (A5 to A6) and large (just over A5). Team up your favourite hobby with a matching notebook. The voyageur features extra pockets for maps photos, tickets and pages can be transferred to a website where you can print and paste perfectly sized pages. 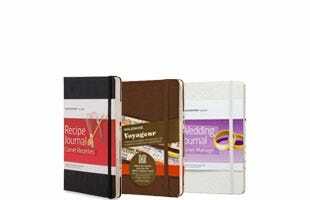 The wedding journal features tabbed sections and a mini bridal book insert to keep the wedding dress a secret from the groom.